Starbucks will close stores and offices across the US on May 29 to conduct "racial-bias education," following outrage over the arrest of two black men in one of its cafes. 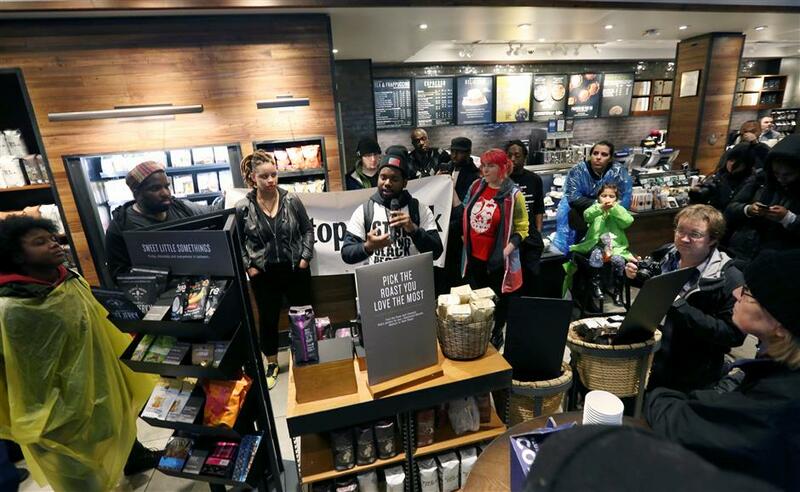 Demonstrators occupy the Starbucks that has become the center of protests on April 16, 2018, in Philadelphia. Starbucks will close stores and corporate offices across the United States on May 29 to conduct "racial-bias education," the company announced on Tuesday, following outrage over the arrest of two black men in one of its cafes. It was the latest bid by the behemoth coffee chain to recover from last Thursday's incident in Philadelphia, which was captured on video and went viral, viewed millions of times. The video posted on Twitter by a Starbucks client shows uniformed police questioning and then handcuffing the two men, who offer no resistance, as a white client repeatedly asks an officer, "What'd they do? What'd they do?" Starbucks said more than 8,000 stores would be closed on the afternoon of May 29 and training provided to nearly 175,000 employees, and incorporated going forward. CEO Kevin Johnson, who has also apologized, said the company was "committed to being a part of the solution" and that he had been in Philadelphia "listening to the community, learning what we did wrong and the steps we need to take to fix it." "Closing our stores for racial bias training is just one step in a journey that requires dedication from every level of our company and partnerships in our local communities," he said. Philadelphia police said they received a 911 call from a Starbucks worker who said the men were trespassing, after refusing to buy anything. Police said officers had "politely" asked the two to leave before finally arresting them. They reportedly asked first to use the bathroom, but were told it was only for paying customers. The two men's lawyer Lauren Wimmer told a CBS affiliate in Philadelphia that they had been waiting for a third man to arrive for a business meeting. Starbucks declined to prosecute and the men were released. Ex US president Barack Obama's former attorney general Eric Holder and Bryan Stevenson, a civil rights lawyer who has exonerated innocent prisoners on death row, will be among those experts consulted on the curriculum, Starbucks said. "Being treated with respect and dignity at a place of public accommodation is an essential aspect of full citizenship," tweeted NAACP Legal Defense Fund, which fights for racial justice and which is also being consulted. "The reality is that most black Americans regularly face the indignities of being treated with suspicion," it added. "This is a crucial next step in fighting implicit bias," tweeted Jonathan Greenblatt, CEO of the Anti-Defamation League, another expert consulted. The woman who posted the video, Melissa DePino, said a Starbucks employee called police because the men had not ordered anything, while they waited for a friend. "All the other white (people) are wondering why it's never happened to us when we do the same thing," she tweeted. "The men were sitting there peacefully quietly and they were put in handcuffs and they were walked out of the store, humiliated, embarrassed and put in a patrol car," DePino subsequently told MSNBC television. Starbucks has also launched a review of training and practices to make reforms where necessary, and once completed, this will be made available to other companies, including their licensee partners, it said. The company has more than 25,000 coffee shops around the world.